It's Feel Good Friday and you know what makes people feel good? Animals. So today we're highlighting the work of the Humane Society of the United States (HSUS). 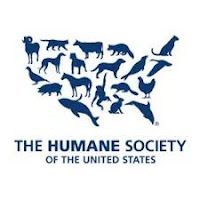 To sum up their work in once sentence from their website, "The Humane Society of the United States is the nation's largest and most effective animal protection organization." Their mission is "celebrating animals, confronting cruelty" and they accomplish it by working in the following areas: animal rescue and care, animal advocacy, and finally, pets and shelters. You can click on this interactive map to get details on the work done in your state. Examples include the animal rescue team which works with local law enforcement to rescue animals from natural disasters, puppy mills, and animal fighting organizations. Wildlife protection focuses on stopping the fur trade, exotic animal trade and the slaughter of seals and horses. Advocacy work includes policies at both state and federal levels and then there's a host of pet care services - adoption initiatives, training for shelter staff and pet care tips. How many animals are they helping, you ask? Along with their affiliates, HSUS provides "hands-on care and services to more than 100,000 animals each year." This short video of Adam and Billy (a dog rescued from a puppy mill) is just one example. An adorable example. You can get involved by subscribing to one of their magazines, making a donation or volunteering. You can also show your support by buying and wearing HSUS gear, liking their Facebook page and following them on Twitter @HumaneSociety. Thank god for the Humane Society!